Orienteering is a rewarding sport in that despite a subpar physical level, one can achieve good results through excellent navigation. The joy of finding controls on fastest routes and the fact that we can’t chase record times as in pure running events are probably the reasons why so many veteran orienteers are still into it. No, I’m not ready to start running veteran races (quite yet), since I find great joy of the Finnish Champs Sprint & Swedish Champs Relay medals I achieved this fall. 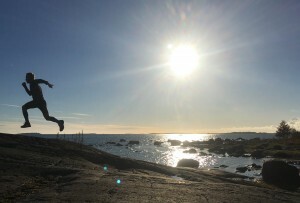 The sprint in Vasa was standard execution throughout the rather simple course while the IFK Lidingö relay bronze a week later in Blekinge was won with the help of Öystein Kvaal Österbö’s routine and Fredrik Bakkman’s ice-cold finish. The terrain type we encountered in the Swedish Champs Relay was novel for me – it truly made me discover new tactics of how to execute an orienteering course in a terrain without contour features. I had not experienced such flat terrain, with such bad runnability before and recognized right there why I enjoy the challenges of orienteering so much: every race situation forces you to reinvent your technique in order to master the navigation tasks under stress. This orienteering season is coming to end soon with just the final World Cup weekend starting today in Aarau, Switzerland and an intensive Park World Tour week in Beijing, China remaining. The last races means there’s nothing to spare but to go all in and enjoy the racing atmosphere.